Amid last week’s snowstorm, Boston bigwigs gathered to officially welcome our newest neighbor, General Electric, to the city. Preceded by an announcement earlier in the day that GE will donate $50 million over five years to area schools (specifically $25 million to Boston Public Schools), community health centers, and training programs, we quickly learned our new neighbor is a good one to have! Further, we got more insight on what else to expect from the company’s move to Fort Point. With such names as Mayor Marty Walsh, Governor Charlie Baker, and Patriots owner Robert Kraft in attendance, GE chief executive Jeffrey Immelt had to make a great sell of his company, and that he did. Forecasting that his company’s arrival would bring thousands of jobs to the area, he anticipated it would also contribute more than $1 billion into the Boston economy on a regular basis. Whereas Silicon Valley grew from the wave of the consumer internet, Immelt feels that Boston’s time is coming with what GE labels the “industrial internet”: industrial engineering with software, sensors, and big data analytics. As far as what those of us in the Fort Point and Seaport neighborhood should expect to see on a daily basis, GE will soon make a splash. While executives will move into a temporary office on Farnsworth Street this summer, work will soon commence on a permanent home. 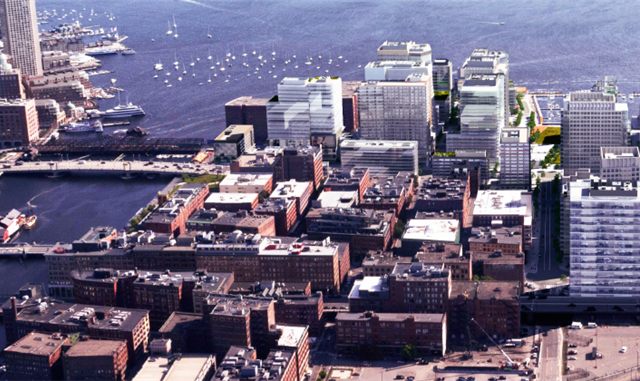 The 2.5-acre parcel will be comprised of two renovated, former New England Confectionary warehouses as well as a new building on land currently part of Gillette’s South Boston campus—forming a waterfront campus directly across Fort Point Channel from the US Post Office’s main Boston branch. As far as what ambiance to expect, Immelt claims it will be filled with open space and the brick-and-beam feel that goes with much of the startup community feel of the quirky neighborhood. Just don’t forget to bring your sunglasses to work, as he added that the new headquarters will also have, “a GE logo you can see from Mars.” GE, welcome to Seaport!